Opioid medicines are pain relievers. They include medicines such as codeine, morphine and oxycodone. Knowing the facts and unraveling a few myths, will help you and your carers understand opioid medicines and therefore manage your pain effectively so you can get on with living as well as possible with your life limiting illness. Palliative care is person and family-centred care provided for a person with an active, progressive, advanced disease, who has little or no prospect of cure and who is expected to die, and for whom the primary goal is to optimise the quality of life. Pain is an unpleasant sensation, suffering or distress. All pain hurts and can wear you down. Pain can make you irritable, make it hard to sleep, reduce your appetite, and make it hard to be active and enjoy life. Not everyone with a life limiting illness will experience pain. Pain can be due to different reasons dependant on the cause and therefore it may take more than one type of analgesia to control it. Pain is not always constant, it can change over the day and with different activities and can fluctuate with your moods, emotions and family life. Pain management starts with having a conversation with your health care professional, whether that be your GP, your specialist such as an oncologist or respiratory physician, or your palliative care team. It is essential that you are open and honest about your pain so it can be assessed and planned for, for you as an individual¹. To get a clear picture of your pain, your doctors and nurses will ask the following questions. The following example is based on SOCRATES mnemonic acronym often used in pain assessment. Site – Where is the pain? Onset – When did the pain start? Was it sudden or gradual? Is it getting worse or better? Radiation – Does the pain radiate anywhere? Associations – Any other symptoms associated with the pain? Non-pharmacological ways in which to relieve your pain may be explored first such as heat packs, positioning, physiotherapy, alternative therapies etc. It may be that you have tried things yourself and it is helpful to communicate about whether or not these things have helped you to better inform the pain management plan. Opioids are medicines or analgesics that are prescribed for strong or severe pain that is no longer responding to medications of lesser strength. They come in different formulations such as tablets, patches or a liquid. Your prescriber will discuss which one is best for you and your individual pain treatment. Opioids have been found to be effective in managing shortness of breath and it may be that you are prescribed an opioid for pain and/ or shortness of breath management. Opioids also have a role in managing severe diarrhoea and cough. Intermittent (or ‘as needed’) dosing– Your practitioner will most likely start you on an intermittent regime of an opioid to take as you need it within certain time parameters. You will need to keep a record of when you take the medication and its effect on your pain and any other side effects, so you can show this to your practitioner at your review. It is essential that you contact them if you have any unwanted side effects as quickly as possible so an alternative can be sort for you. Your community pharmacist is an important resource in medication management and you may want to discuss the medication with them as well. Slow release dosing– Once you have a documented regime that shows you would benefit from a slow release opioid, your practitioner will provide you with a new regime with a slow release opioid. This tablet may be taken once or twice a day or you may have a skin patch that needs to be changed every 3 or 7 days, dependent on your clinical need. You will still be able to take intermittent dosing as pain can still come and go with your daily activities and it is essential that you can control it so you can continue living as well as possible with your disease. It is important that if you are needing more than 3 intermittent doses per day, that you contact your practitioner to revisit your slow release dose. Also remember that this type of medication cannot be crushed or broken into smaller parts. Combination dosing- Your practitioner may prescribe other medications such as a weak analgesic like paracetamol which can complement opioid management or an adjuvant. Adjuvants help with other types of pain from different sources such as neuropathic (nerve) or visceral (organ) pain, and can provide an umbrella effect when addressing all aspects of your individual experience of the pain. Often adjuvants can help reduce the need to increase opioids and can provide a more steady state in your pain management experience. All medicines have two names: a generic name and a brand name. Each medicine has only one generic name, but if it is sold by more than one company it will have different brand names. For example, oxycodone is the generic name of the trade name medication ‘Endone’. Endone is the oxycodone immediate release formulation at 5mg dosage. Dosages 10mg or more of oxycodone immediate release is known under the trade name ‘Oxynorm’, while oxycodone slow release formulation is called ‘Oxycontin’. Take your medicines regularly at the times prescribed (or as close as possible to those times) to get the maximum benefit from them. For example, delaying an opioid medicine that takes time to start working may result in you experiencing pain that could have been avoided. 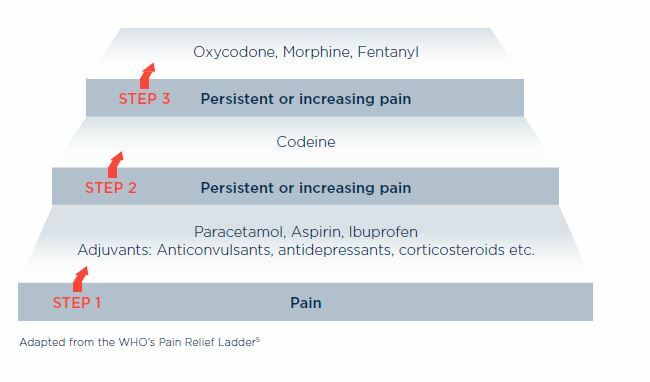 Knowing when, how and why to use your opioid medicines, and knowing who to ask if you have problems is a big part of achieving good pain relief. If you have any questions about your medicines, ask your prescribing practitioner or another member of your health care team which includes your pharmacist. Organising your medicines safely and having an adequate supply on hand so you never run out, particularly over weekends or public holidays. Ask your pharmacist for advice, and talk to them about packaging your medicines in a weekly medication organiser and about safe storage. Most opioid medicines are supplied under the Pharmaceutical Benefits Scheme (PBS), so their cost is subsidised by the Australian Government. If you are having difficulty paying for your medicines, talk to your practitioner so they can look at prescribing medicines you can afford. Also, talk to your pharmacist about ways to save money on your medicines. knowing what to do if you forget or miss a dose – for example, whether you take it when you remember or wait until the next scheduled dose? Some people fear that being prescribed opioid medicines means that they’re closer to the end. Relieving your pain changes your quality of your life, not its length. Sometimes people worry that the side effects of their opioid medicines will be worse than their pain. Not everybody experiences side effects and it is important to remember that side effects are not an allergic reaction, and are often temporary and manageable. Tell your practitioner promptly about any side effects, their severity and when they occur. Opioids can be addictive when used for incorrect purposes however when use appropriately under guidance of a practitioner, it is not normally a concern for patients. It is likely that tolerance may develop or pain may increase as your illness progresses leading to a need to increase your opioid doses. This is a normal part of pain management treatment. Other ways to address tolerance is prescribing a different medicine or adding in an adjuvant. Some people stop taking their pain medicines because they are worried the medicines will mask the progression of their illness so they won’t know how they are really feeling. Pain medicines will not stop your health care team or you from monitoring the progress of your illness because there are other signs and symptoms of progression that will be assessable. Pain management should only start once the pain is unbearable. Some people only tell their practionier about their pain when it gets really bad. However, it is usually easier to manage pain in its early stages and that provides a good basis for ongoing management and gives the practitioner historical information about your pain. Breakthrough pain means the plan isn’t working. Breakthrough pain is pain that occurs while on slow release pain management. This is a normal part of living with your illness and you may find that your pain occurs at predictable times of the day ie having a shower, going out in the car, in the earlier hours of the morning. Your practitioner will provide you with a suitable medication for intermittent dosing that you can use pre-emptively or at the time of the pain occurring. It is essential you keep a diary of this use to be reviewed by your practitioner to make sure your plan is still meeting your needs as an individual. Your best source of information is your practitioner and care team. There may be times when you want additional information from one of the many organisations that provide help to patients and their families. Palliative Care Australia Inc. (PCA) can direct you to your state or territory palliative care association. The PCA website also has useful information about palliative care, a directory of palliative care services, and other resources for patients and carers. Commonwealth Carer Resource Centres have services and information for family carers.